Actually, there are no elections in Cuba,” says Omar Lopez, human rights director of the Cuban American National Foundation. “People vote but they don’t have the possibility to choose, because all candidates belong to the Communist Party, the only one allowed in Cuba,” he told The World Weekly. On March 11, more than eight million Cubans elected 605 members of the Communist Party to the National Assembly of People’s Power, the highest legislative body on the island. On April 19, the national assembly will select Cuba’s next president, most likely current First Vice-President Miguel Díaz Canel. Some parliamentary figures could be replaced by candidates from a younger generation, bringing some potential for change. But without a second party to vote for, there is little sense of excitement. In a country where the state maintains control over much of the press, it is seen as significant that most independent news outlets expressed apathy towards the election. The municipal elections in November 2017 provided a glimpse into some of the obstructions democracy faces in Cuba. The Economist reported that those opposing the Communist Party in ‘alternative’ parties encountered near-comical attempts to keep them off the ballot paper. One candidate received a phone call saying a package was waiting for him from a friend in the US. When he arrived to collect it, police officers escorted him to a car and drove him around until the nomination meeting had ended. Nevertheless, this is a time of change. The new elected president will be the first Cuban ruler in six decades whose surname is not ‘Castro’. President Donald Trump’s reversal of his predecessor’s reconciliatory foreign policy, introducing tighter commercial restrictions has allowed Russia to increase its trade with Cuba, in a bid to eclipse Washington’s power in the region, commentators say. Russian exports to Cuba rose by 81% from 2016 to 2017. But in spite of these seemingly seismic power shifts, the aperture for reform is narrow. Outgoing President Raul Castro, who was handed the presidency by his brother Fidel Castro 12 years ago, will continue to lurk behind the scenes, remaining as head of the Cuban Communist Party until at least 2021, and as head of the armed forces and a member of the National Assembly indefinitely. His son is also an important figure in the interior ministry, and his daughter is a member of the national assembly, and heads up Cuba’s most significant gender think-tank. Power, therefore, remains firmly seated on the branches of the Castro family tree. Some critics have compared Cuba’s power structure with China’s. The fact that China’s National People’s Congress recently removed presidential term limits, potentially allowing President Xi Jinping to rule indefinitely, casts “a dark shadow over future developments in Cuba”, Mr. Lopez says. The story of this election, critics say, is just the story of a new name. Cuba and the United States are only separated by around 160 kilometres of water. But since former US President John F. Kennedy’s 1962 embargo against the island, and President Trump’s decision to uphold it, the symbolic distance is far greater. Washington imposed a trade embargo on Cuba in 1962 as punishment for Havana’s expropriation of US-owned oil refineries and properties, and increasing taxes on US imports. US legislation from 1992 states that the embargo will remain in place until Cuba conforms to international standards of human rights and democratic values. Some have suggested that the elections open a window of possibility for the embargo to be lifted, and for normal relations between the countries to begin - a change which could benefit Cubans and Americans alike. “Direct foreign investment from the US would quickly flow to Cuba as one of the most needed sources of capital for a stagnant economy,” Jorge Duany, director of the Cuban Research Institute at Florida International University, told TWW. President Trump, however, seems to have other ideas. “He promised conservative Cuban Americans in Florida that he would reverse Obama’s Cuba policy if they voted for him,” says William LeoGrande, a specialist in US foreign policy toward Latin America at The American University. “He got 54% of the Cuban American vote and thinks that’s why he won Florida. So he is keeping a campaign promise and paying a political debt”. This 54% vote share is concentrated in the older generation of Cuban Americans who remember the failed 1961 ‘Bay of Pigs’ invasion under President Kennedy, in which exiled Cubans and Americans joined forces to try and topple Fidel Castro’s government. The majority of Cuban-Americans remain opposed to lifting the embargo on Cuba and traditionally vote Republican. 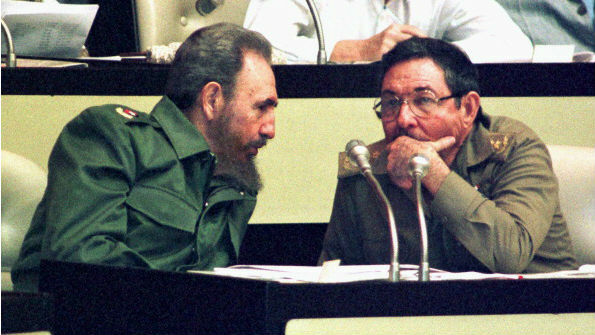 What would it take for Cuba-US relations to warm? Normalisation, Mr. Lopez explains. “The recognition from the Cuban regime of international standards of human rights and democratic coexistence”. But Cuba’s human rights abuses show no sign of waning, meaning the chances of change remain slim. Marselha Gonçalves Margerin, the advocacy director for Amnesty International Americas, told TWW that students regularly experienced restrictions on access to information, and that Amnesty received reports of workers being pushed out of employment for expressing certain opinions. Cuba’s one-party system has insulated the island from the shift to the political right that has swept South America and the Caribbean in the past few months. On March 9, Chile voted out its female socialist leader, and voted a conservative billionaire back into office. Two days later, elections in Colombia saw right-wing parties gain seats in Congress. These countries follow Brazil and Argentina, which both saw conservative governments come to power in the last couple of years. Critics have attributed this swing towards conservatism as a reaction to corruption scandals on the left. Others argue that many in Latin America have begun to take left-wing policies such as healthy state pensions and free education as a given, and are demanding more from their governments. Cuba is now most directly comparable with Venezuela, a fellow socialist ally similarly ruled by a de facto one-party system, and suffering under increasing authoritarianism and economic plight. There was 82.9% participation in the Cuban national assembly elections according to the preliminary results, which the government says “reaffirms the electoral system”. For change to take place in Cuba, the entire system would need overhauling, says Professor Duany, as the current system of voting “seems to be primarily a ritual exercise in popular participation”, designed to legitimise the current government, rather than “to channel growing demands for change from the bottom up”.